"The return to the market is a tool. The aim is fair growth"
Emblematic Greek Leftist Manolis Glezos corrected a rude move by former House Speaker Zoe Konstantopoulou, who tried to stop German Ambassador to Greece Peter Schoof from placing a wreath in the monument of Nazi victims at Distomo on Saturday. During a memorial ceremony for the Nazi attrocity, the German Ambassador to Athens was to place a wreath on the monument of the massacred Greeks. 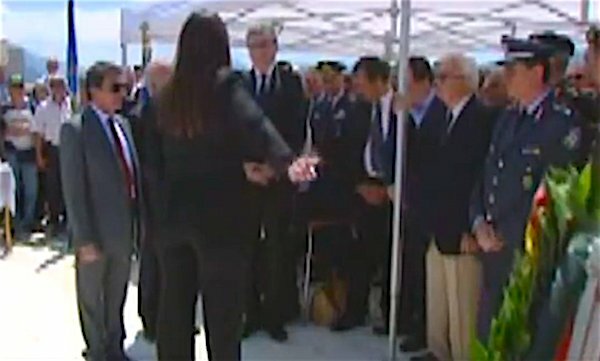 At that point the former parliament president Konstantopoulou stood before the ambassador blocking his way telling him that Germany has not made reparations for the crime and the wreath would be an insult to the victims. She also said that Germans still occupy Greece in the form of the bailout program. The 93-year-old Glezos stood up, took the German ambassador by the hand, went around Konstantopoulou and helped him place the wreath on the memorial plaque. The Distomo massacre was a Nazi war crime perpetrated by members of the Waffen-SS in the village of Distomo during the Axis occupation of Greece in World War II. The German soldiers executed 214 men, women and children and then burned the village in retaliation to the attack against a German convoy by Greek resistance fighters.